Consider the boxes in your attic right now. Or the ones in your basement. Your garage. Your closet. What have you set aside? What don’t you use very often? Is it an acoustic guitar you bought when you were going through that phase? Stacks of old records, cassettes, tapes, or DVDs? Do you have piles of old books, keepsakes, clothes, cards, or photos? If you stop to think about all the stuff in your home right now, you might be surprised about just how much you have. Most of us are. We don’t want to alarm you, but a lot of that stuff is sensitive to temperature. If it’s not being stored in the right climate, it could be damaged or warped. If you want to prevent temperature extremes from damaging your valuables, it’s as simple as paying a little more attention to the air temperature where you’re keeping them. In this blog, we’ll answer a few questions about temperature sensitive items, and how you can better protect your stored valuables. What Kinds of Items are Temperature-Sensitive? Unfortunately, a lot of stuff is susceptible to temperature-related damage. Especially the kind of stuff that tends to be stored in one place for extended periods. Wooden or leather furniture, books, electronic equipment, appliances, and even anything metallic could rust or be damaged if stored improperly. Even items you wouldn’t think are temperature-sensitive can be. If you store your old guitar in a room with differing air temperatures, the wood might warp. Improper storage could also compromise CDs, vinyl, art, and even clothing. Generally, anything that could be misshapen or that deteriorates in cold, hot, or wet conditions should be kept in a controlled environment. That goes double if what you’re storing is delicate and easily broken or rendered useless. Instruments, for example, require precise construction to work properly. The next time you try strumming away on that old guitar and it sounds terrible, consider where you’ve been keeping it! What Happens if I Store Items Improperly? Uncontrolled extreme temperatures or temperature variation can have a wide variety of effects on your valuables. Anything pliable, like wood, leather, and some plastics, can become warped or misshapen by fluctuating temperatures. In some circumstances, wood could even crack or split. Fabric, including clothing, and paper could yellow or corrode in damp environments, and might also grow mold, mildew, or bacteria. At very high or low temperatures, or in damp environments, metal will rust, weaken, or corrode. Electronic appliances won’t function as efficiently and may break down. In the long term, unprotected environments could attract pests like rats, wasps, mice, termites, and other vermin. This is especially likely if your storage area is uninsulated or damp. How Do I Know if My Stuff is At Risk? This will largely depend on where you live. If your home gets hot in the summer, cold in the winter or at night, or both, you should keep your valuables in a temperature-controlled environment. If you live near water or in an area where it rains a lot or is often humid, this goes double. Humidity is especially hard on sensitive items. Keep in mind what you’re storing and how you’re storing it. Tupperware or plastic boxes keep the elements out better than cardboard or paper. Even items you keep in cases or boxes are not invulnerable to extreme temperatures, however, so don’t make the mistake of boxing something up and forgetting about it. If you are storing anything that’s likely to absorb heat or cold, like leather, you should absolutely consider moving those things into climate-controlled storage. If, in fact, you need climate-controlled storage, check out our blog on the subject for some questions to ask yourself. What’s the Right Temperature for Storage? When it comes to keeping your storage cozy, there’s a “goldilocks” zone: between about 55 and 80 degrees Fahrenheit. This is, as the fairy tale goes, “not too hot and not too cold.” It’s also important that the air in your storage area isn’t too humid or moist. Most importantly, your storage area’s temperature should be more-or-less consistent. Some variation (about 10 degrees) should be alright, but any more than that could have a negative warping effect on the items stored there. You want all three of these; the more you’re missing, the worse the situation. For instance, if your attic sometimes gets cold, that’s not ideal, but if it gets cold in the winter and hot in the summer, that’s worse. If the air in your attic is humid, too, you have a big problem. Store your temperature-sensitive items in a room that never gets hotter or colder than 55 to 80 degrees Fahrenheit, that stays a consistent temperature, and where the air is relatively dry. How Do I Temperature-Control my Storage? First, insulate your storage area. A backyard shed works well for certain tools and appliances, but you shouldn’t use it for temperature-sensitive items. Then, keep that area dry. Most of the air in your home probably isn’t damp, but basements, attics, or closets can be. Running a dehumidifier will work to dry out an otherwise damp part of your house or storage, but that can get expensive. Consider keeping a thermometer in your storage area. Check to make sure you’re staying in the “goldilocks” zone and that the temperature in the room isn’t fluctuating more than it should be. If you can feel a draft, try to isolate where that’s coming from and address it. Not only will that help you better control your storage environment, it’ll save you money on heating or cooling. The best way you can keep your storage temperature-protected is keep our tips in mind. 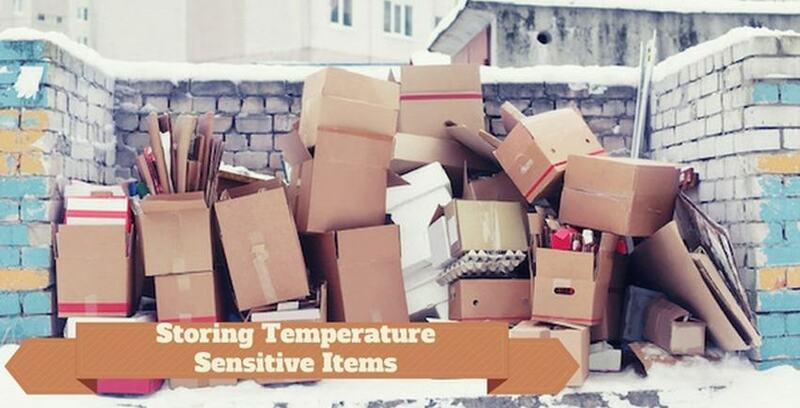 Keep at-risk items out of uncontrolled areas and take steps to temperature-proof the places where you put your things. Still have questions? Check our blog for more info. Want to rent a little more space to keep your temperature-sensitive items? Please get in touch with Storage Direct today.